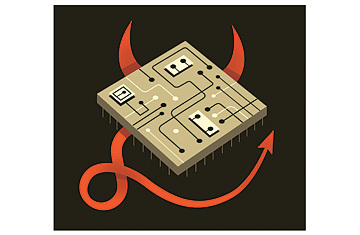 Is big tech replacing the big banks and Wall Street as the corporate villains du jour? The spate of bad publicity in recent weeks for a number of large technology firms, most notably Apple, has me wondering. In the wake of a scandal over working conditions at factories it contracts with in China and criticism over job creation in the U.S., Apple is now playing defense on taxes. A New York Times story recently outlined the ways the company avoids shelling out more to the government by using a shell game of offices and operations in various no- and low-tax states, from Nevada to the Netherlands to the British Virgin Islands. It's all perfectly legal, but as Mitt Romney can tell you, neither rich people nor rich corporations (they're the same thing, remember?) do very well on the popularity front that way. No wonder Amazon struck an unexpected tax deal on April 27 with the state of Texas. The Internet retail behemoth had been refusing to collect sales tax from customers there since it has no store in the state. After a protracted legal battle, Amazon opted to pony up, and it also plans to build several distribution centers, thereby shifting its image from tax dodger to job creator. The company will have to begin collecting taxes in California as well this fall as part of a deal cut last September after a similar tussle with officials in that state. There are plenty of other Big Tech skirmishes under way. For a year, the Federal Trade Commission has been carrying out an antitrust investigation of Google, and the feds recently upped the ante by hiring a former prosecutor of the Oklahoma City bombing case to help run it. In February, right after Facebook filed to raise $5 billion in an IPO, a large California pension fund challenged the company over its corporate governance, citing a lack of diversity on the board and too much power concentrated in the hands of CEO Mark Zuckerberg, who controls about 57% of the voting stock. So it's no surprise these companies are revving up their p.r. and lobbying engines. I think this is just the beginning of a longer-term shift in which technology replaces banking and finance as the industry most likely to worry government and the public. Sure, bankers are still rich, but they are wounded and in retreat. Profit margins are falling, boards are reining in their pay packages, and regulation, while not a perfect cure for the industry's ills, will ultimately go some way toward dampening the high-risk, high-reward business model of Wall Street. Meanwhile, tech firms are flush: the Nasdaq tech-stock index isn't quite at 2000 bubble levels, but it's broken through last year's postrecovery peaks and is rising. It will be interesting to see if the Facebook IPO, scheduled for May, becomes a high-water mark for the industry. The Facebook flotation will produce another batch of young Silicon Valley multimillionaires. And in the midst of an increasingly heated conversation about inequality, taxes and job creation, that's suddenly become dangerous territory to  pardon the pun  occupy. Steve Jobs was once quoted as asking, "Why join the Navy if you can be a pirate?" But when you are the most valuable company in the world, it's harder to play the rebel. The truth is that Big Tech is as corporate as it comes  and since Big Tech is also where most of the new growth and income creation in this country is right now, there's little doubt that these companies will draw more and more attention from regulators, tax collectors and social activists. How well the industry defends itself may depend on how many new jobs it can account for. After coming under fire for outsourcing, Apple recently published a study showing that it had "created or supported" 514,000 U.S. jobs, far more than the 47,000 Americans currently on its payroll. The study's methodology can be interpreted and spun many ways, but the bottom line is that this is going to become a more heated political issue in the years ahead. Technology has historically always created more jobs than it has destroyed. But the periods in which the creative destruction happens aren't pretty, and they tend to be characterized by high levels of inequality or social discontent  think Victorian England or the decades preceding the 1929 stock-market crash in the U.S.
A number of academics, including folks at tech-friendly places like MIT and Stanford, believe we're entering one of those periods. That's why it will become crucial for Big Tech to prove that it's enriching the 99% as well as the 0.001%. As the folks on Wall Street know, social issues can very quickly become just as important as your social network.